all-inclusive luxury awaits couples at Paradisus Palma Real Resort Wedding Venues Located on world-renowned Bávaro Beach in Punta Cana, the 554-suite resort is surrounded by tropical gardens and a breathtaking stretch of white-powder sand, at its heart a spectacular pool playground for relaxing days in the sun. Beyond the beautiful setting, plush amenities and impeccable attention to detail set this destination apart. Suites are generously sized and come with mahogany furniture, marble floors, double Jacuzzis, flat-screen TVs and private terraces. Guests can also stay in special suites that feature the resort’s adults-only Royal Service program, including butler service, pillow menus and access to a private pool and beach area. Those traveling with children may want to escape to an ultra-exclusive area of the property called The Reserve, taking advantage of its distinct Family Concierge service. Paradisus Palma Real Resort Wedding Venues With 12,447 square feet of flexible event space, including the magnificent Olympus Ballroom, the resort can accommodate weddings of up to 550 guests inside. 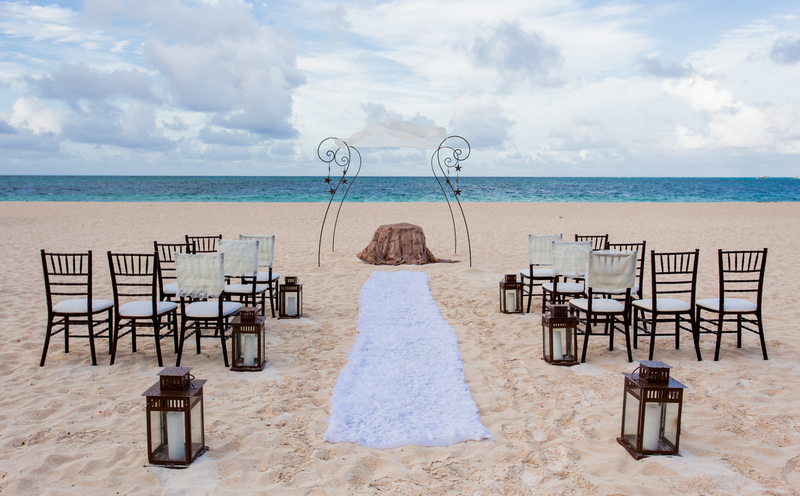 Outdoors, a garden and poolside gazebo and two beachside locations—Naos and Gabi—offer ideal sites to exchange vows. Following the “I dos,” Naos Beach, Gabi Beach and the Olympus Terrace can host receptions of up to 300.